International Publishers Association - IPA Blog - WIPO Diary (SCCR 34) Day 5 - The end of the beginning or the beginning of the end? Fridays at the SCCR are always unpredictable, and Friday 5 May was no exception. Yet whereas the usual drill is the final plenary dragging on late into the evening to enable time for a satisfactory closure, today was a little more mysterious. For starters, there was more backroom huddling than open plenary debate at times when the sessions were theoretically meant to be live. The chamber stood eerily quiet for much of the day. 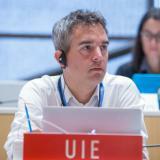 This was largely driven by the chairman, Daren Tang, who was anxious that his first SCCR should conclude with a substantive recommendation to the budget-setting WIPO General Assemblies, in October. In his own words, the goal was to produce something more meaningful than the usual safe recommendation that the SCCR should merely keep strumming away at the incumbent agenda. However, having resumed the final plenary at around 4pm, Tang then quickly adjourned it again to allow the national groupings to hold decisive in camera talks, and draw a confident line under the week’s work. It was after 7pm when the Chair’s Summary finally made its way into the hands of the clutch of never-say-die participants who were still in the room (our own Secretary General José Borghino among them), but its contents were someway short of the chair’s hopes. Basically, every agenda item will continue to be discussed at the next SCCR, in November, when a raft of further studies and documents will also play a part in the discussions. 5. A complete study on the implications of the resale right, led by Professor Kathryn Graddy. So there’s plenty for the delegates to chew over before and during SCCR 35. Though, truth be told, each SCCR sitting somehow seems to push the possibility of a concrete outcome ever further out of reach. But that’s the nature of multilateral negotiations on this epic scale – it’s like herding cats. No one ever said it would be easy to carve out consensus from the divergent viewpoints of 189 countries over a subject as complex as copyright law. The fact that WIPO and its member states are making the attempt anyway attests to the fundamental importance of copyright to the world’s social, cultural and economic ecosystems, and human development itself.